Winter is coming, and it brings more days indoors snuggled up watching sports and movies. Just because it is cold outside, doesn’t mean it can’t be rocking inside. Knowing what type of paint to use for a projector screen will bring your favorite digital activities to life. My recommendation would be to select the most suitable color from Paint on Screen. I’ve been a fan of projectors for several years and have tried various ways to make a home projector screen. I’ve used tablecloth stapled to the wall, built portable screens, and have even used paint to turn my entire wall into a giant screen. Through the process, I have found that the best way is just transforming a wall in your home into an accent wall that doubles as your screen. What Type of Paint to Choose? I wish there were just a quick and straightforward answer to this question, but the reality is that the type of paint you need to get the best performance will depend on a few factors. Each of the three factors impacts the brightness of the image from the projector screen. Lower lumen projectors and rooms with more ambient light will require a paint that is more reflective to maintain crisp color. Conversely, higher lumen projectors and lower ambient light will need less reflective paint that won’t create glare. The same applies to what you watch. Brighter programs require less reflective paint and darker programs more reflective. I have found that video games and HD movies need a slightly higher reflectivity to create the contrast necessary for the deep black color found in these mediums. The best option for your projector is special screen paints. Screen paints are easy enough to find and are formulated to provide the absolute best home theater experience. Most brands, like Digital Image Screen Paint or Paint on Screen, have formulas that match the paint to your setup. The downside with these paints is that they are quite pricey. Most types have a range of around $150-200 per gallon of paint. If that price range little out of your budget, there are still options at your hardware store to help get you up and viewing. The least expensive option is latex paint. Latex has the shortest lifespan of the paints available for setting up your home theater. Latex is also the easiest to apply, and each gallon has a broader coverage area than the screen and acyclic types. When going with the lower-priced options, the best performing pains are often the satin finish. Satin helps provide the right balance between absorption and reflection to allow for accurate color, without producing glare from the projector light. You can find any number of reasons to go with a projector. One of my favorites is bragging rights. There is nothing like having a friend announce their new 70” screen and then showing them your 161” display. That’s the size you can get with a good projector and a 9-foot by 10-foot screen. I also love that my favorite sports (>>>Check projectors for sports buying guide), video games and movies become life-sized with a projector. Combined with a good sound system, you have the most realistic viewing experience. Before you pick out your paint and start watching there are a few details you should address first. You can’t use just any old wall in your home. You need to find a wall that is large enough to handle the size of your screen while leaving a little room at the edges. Different input sources will have different image display sizes, so you want to make sure the wall can handle a range of displayed images. Once you have your wall selected, you need to clean the wall and check it for imperfections like bumps and texture from previous paint jobs. The best approach to this task is to get the room as dark as possible and use a light aimed along the face of the wall to look for raised areas. Use a light sandpaper to even out elevated areas of the wall. This step is a little tedious, but it will help eliminate image distortions, like making everyone look like they have a giant mole on their face. 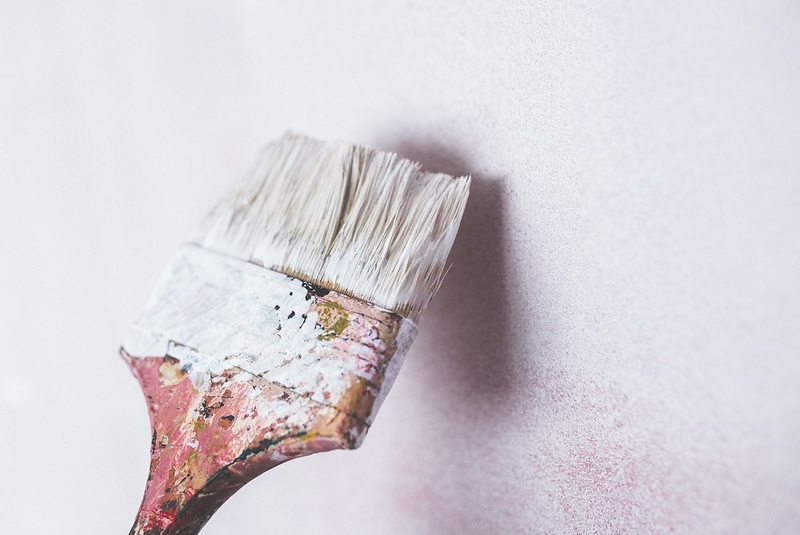 After the wall is even, use soapy water or light detergent to clean the wall of dust and dirt to allow your new paint to adhere evenly and adequately. Now that the wall is smooth and ready lay down a layer of white primer to allow you to start with an even color layer. You projector paint will reflect the light image at you, and uneven color will create distorted image reflection. With the right wall and the best paint, you have the beginnings of a home theater that can rival your local cinema. Never forget to take into account the capabilities of your projector and take your time selecting your paint. Don’t rush the job and you will never have to pay for overpriced popcorn and candies again.